Vacation home situated in the countryside, surrounded by the woods of Montecarlo and in the hills east of Lucca. 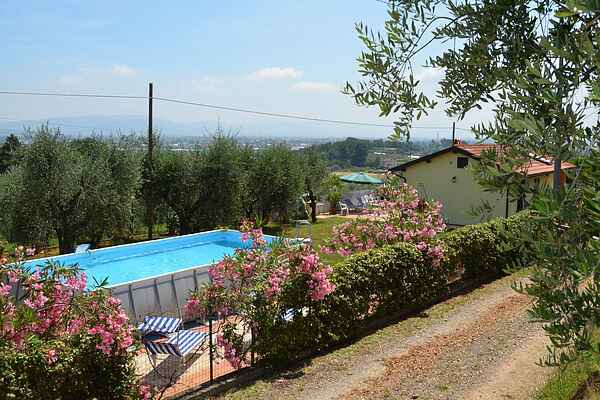 The house is a short distance away from an inhabited village in the open countryside, surrounded by lovely hills covered in olive groves and featuring a beautiful view of Pescia, Uzzano and Montecatini. This allows guests the possibility of having access to essential services (pharmacy, post office, food stores and means of transportation within 4 km) and easy connections to Lucca; the coast via motorway takes only 10 minutes by car without ever leaving the peace and privacy of the countryside. The house features a large and well-maintained garden equipped with gate and an enclosure where guests can relax alongside the pool (aboveground, 8 x 4m, depth of 1.32m) or take in the sun on the deck chairs. A slide is available for children who want to have fun alongside their parents. Finally, along the side of the house there is a beautiful veranda equipped with table, chairs, kitchen area with gas stove and sink with hot water where you can eat outside during the beautiful summer evenings and enjoy the gorgeous view of the surrounding landscape. The house was recently renovated and is decorated in a modern and functional fashion. Parking for the property is located outside the gate.